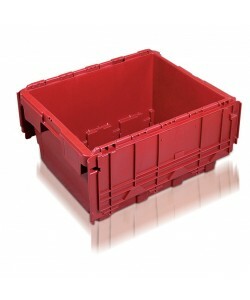 Our wide range of industrial quality, plastic attached lid containers, plastic tote boxes and crates includes 400x300mm, 600x400mm and several non-euro sizes, are stackable and nestable, and are widely used across a range of industrial applications, especially for moving, storage, handling and in retail distribution. We have a full choice of plastic dollies and steel dollies and plastic trolleys to suit to enable the moving of these crates and boxes safely and securely. Many of the plastic storage boxes have a European standard sized footprint which allows them to be stacked efficiently onto a Euro sized plastic pallet, often known as Euro pallets, utilising all of the available space. 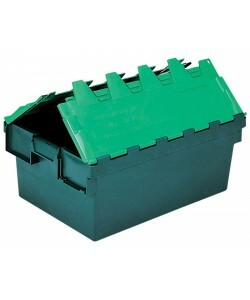 Once emptied, the durable plastic stack nest boxes can be nested inside one another to save up to 75% of the space. Perfect for when space is limited! 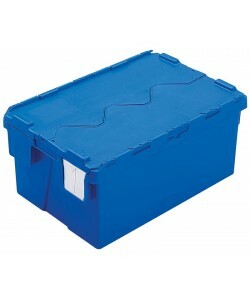 Security is also a main trait of the attached lid container range that we supply. The plastic boxes harness incredibly strong hinges, preventing the lid from being removed whilst the plastic containers are sealed. Each size of tote box can be supplied with additional security or tamper evident seals, making them ideal for transporting products or materials of some value, such as meats or produce within the food industry. 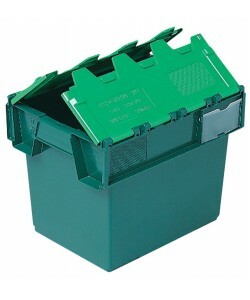 The plastic storage boxes can also be printed onto, displaying company details or content information if required, on either the sides, ends or attached lid of the plastic crates. For more information on printing and labelling services for tote boxes and attached lid boxes, please call our expert team today. Many of our attached lid plastic containers range are compatible with the rotoX plastic dollies, exclusive to Fletcher European. The rotoXD90 plastic dolly is compatible with the 10020 and 10025 tote boxes, when two stack are placed side by side. Our AT432204, 10040, AT642604, FE643AL, 1005B, 1006B and the AT644004 are also compatible with this 600x400 plastic dolly, in single stacks providing excellent handling and manoeuvrability. 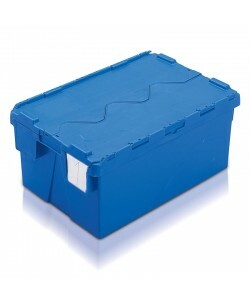 The larger 10083 plastic crates are suitable for use with the rotoXD74 skates, due to their non-standard size. Wheeled plastic dollies are manufactured from food grade polyethylene and prove to be a hygienic, safe and secure method of handling stacks of plastic stack nest containers and tote boxes. 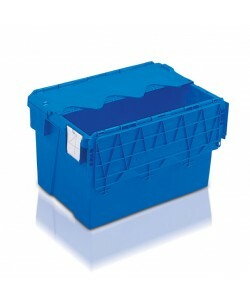 Fletcher European are a UK stockist of Schoeller Allibert plastic crates, plastic containers, Euro containers, confectionery trays and plastic storage boxes. Holding large amounts of stock we are able to supply our customers with quality plastic storage containers quickly and efficiently.